MoDals is a Dalmatian modelling service that provides professional and experienced Dalmatian models for all occasions. View our Portfolio to discover our quality modelling work or simply Book a Dalmatian via our booking form. The Modals Dalmatians are not your average pet models. All of our models are trained champion show dogs bred/owned by CCDalmatians (the registered Dalmatian breeder arm of MoDals). 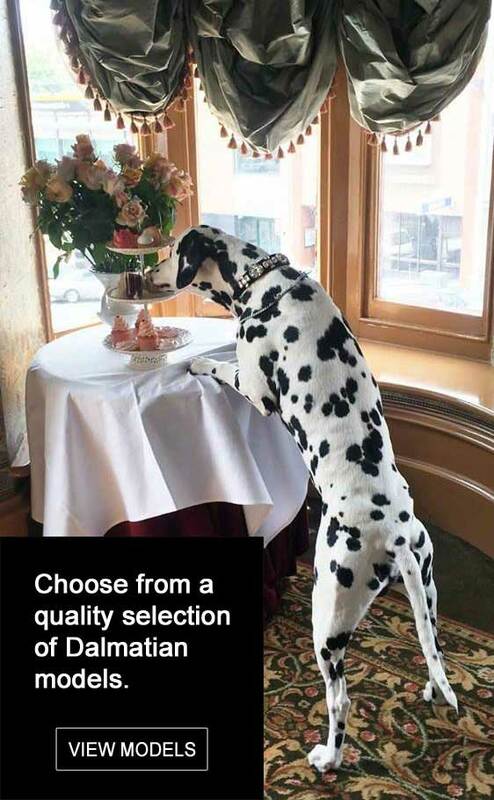 As Dalmatian fanciers/breeders with over 25 years experience we are able to provide a professional and reliable dog modelling service that fits most purposes. Our canine models have experience working in many different situations from professional photo and film crews right through to children’s birthday parties. All of our Dalmatian models come with a registered dog handler who is experienced in the training and showing of dogs. Our handlers are able to take direction and can generally accommodate any reasonable modelling request that you may have. The home of MoDals is Ballarat VIC however our Dalmatian models are able to service the greater metropolitan Melbourne area. Additionally to this and due to our extensive involvement within the national Dalmatian fraternity we are also usually able to source models Australia wide should you require a model outside of VIC. Simply Contact Us to source a Dalmatian model where you need it. If you’d like to know more feel free to Contact Us. We are always happy to discuss any future MoDals modelling/appearance assignments with you.